A pulley doesn't use fuel or electricity, and it doesn't run on its own, but it's still a machine. Not a machine in the way the word is defined by the Merriam-Webster dictionary, but a machine in the way engineers define the word: "Simple machines are devices that can be used to multiply or augment a force that we apply — often at the expense of a distance through which we apply the force." Some scientists regard the screw and wedge as special types of inclined planes, which reduces the list to four entries. You can even regard the pulley as a special case of a wheel and axle and reduce the list to three items. No matter how many items are on the list, though, a pulley qualifies as a machine. The ratio of the output force of a machine to the force you apply to it is known as the machine's mechanical advantage (MA). For a machine to be a machine, the output force must be larger than the input force, which means the mechanical advantage must always be greater than 1. The greater the mechanical advantage, the less force you have to input into the machine to make it work. You can calculate the mechanical advantage of a pulley system by calculating the force required to lift a load to a certain height without a pulley (the output force, FO) and then calculating the force required to do it with the pulley (the input force FI). The mechanical advantage is the ratio of the output force to the input force: MA = FO/ FI. The smaller the input force is in relation to the output force, the greater the mechanical advantage. For a simple pulley system, the calculation of its mechanical advantage is ridiculously easy. You simply count the number of ropes that support the load. Once you know the mechanical advantage, you can calculate the force needed to lift a known weight. Force and weight mean the same thing, so by calculating the mechanical advantage, you'll be able to figure out the pulley load reduction. "Wait," you say. "How do you know that the mechanical advantage equals the number of ropes?" To answer this question, you need to know what work is, and not the kind of work you do at your 9-to-5 job. W = F • d.
Work is related to energy, and since one of the most fundamental laws of nature is that energy is always conserved, work must be conserved. If the force applied to a pulley system is less than the force needed to lift the load, something must change to make the amount of work you do equal the amount of work needed to lift the load. The quantity that changes is distance. You apply less force to lift a load when using a pulley system, but you have to pull more rope to raise the load to a particular height. If you have a double pulley system, you have to pull twice as much rope; in a triple pulley system, you have to pull three times as much, and so on. In fact, for any pulley system, you can calculate the amount of extra rope you have to pull by counting the number of ropes supporting the load. Weight and force aren't different quantities. An object's weight is nothing but the force exerted on it by gravity, so when you lift an object, you have to exert a force equal to the gravitational force. If you have a single pulley system, the pulley allows you to pull down on the rope instead of up, which is definitely easier, but the force you exert is still equal to the weight of the load you're lifting. If you add a pulley below the first one, loop the rope around both pulleys and suspend a load from the second pulley, the load is now supported by two ropes. 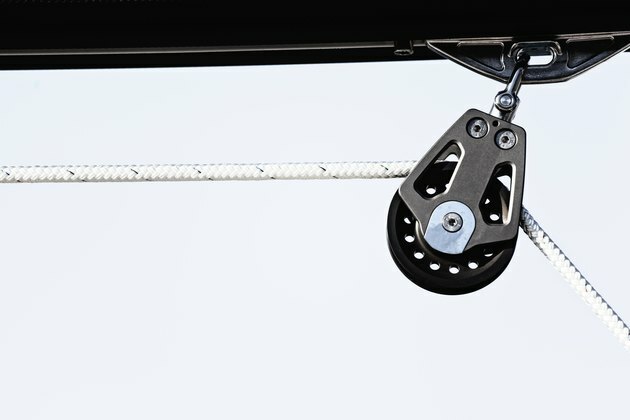 The mechanical advantage of this new, improved pulley system is therefore 2, and that means you only have to exert a force equal to half the weight of the load to lift it. Suspend a third pulley from the first, loop the rope through that so three ropes are suspending the load, and the force you have to exert to lift the load is only one-third of its weight. You could say, in general, that the pulley load reduction is the reciprocal of the number of ropes supporting the load, but few practical pulley systems have more than four ropes. Consequently, the maximum pulley load reduction you can realize is one-quarter the weight of the load. In reality, the actual load reduction is slightly less than this because you have to take into account friction in the pulleys. Suppose you can lift a 200-pound person by yourself, but that's the limit of your weightlifting abilities. Could you devise a pulley system to lift a 2,000-pound automobile? Probably not because even a four-pulley system would reduce the weight by only a quarter, and that's still 500 pounds. Suppose you could rig up a pair of pulley systems and get a friend, who is as strong as you, to pull one of them. You'd still have trouble, but you might be able to do it because each pulley would lift half the weight, or 1,000 pounds, and a quarter of that weight is 250 pounds. If you added a third pulley and a third person to the job, however, each person would only have to exert 167 pounds of force, which is well within their ability, so this system would work easily. A pulley weight calculator doesn't depend on which weight will lift first as the rope is pulled because if one person pulls before the other two do, the car won't move. All three people have to pull simultaneously to properly share the load and spread the weight evenly among the three pulleys. When the three people work simultaneously, there are, in effect, 12 ropes supporting the car, which makes the mechanical advantage of the pulley system 12 and reduces the net force required to lift the vehicle to 2,000 ÷ 12 = 167 pounds.